Queen Abigail the Wise prominently features an icon that Abigail sets her sights on. I’m aware, of course, that icons aren’t a fixture in every Christian household, but for those of us that do have some up in our home or in a prayer corner, our feelings and connection to them are sometimes hard to explain. The fear from modern-day iconoclasts is that icons betoken something idolatrous, magical or occult, but that is really quite far from the truth. Speaking for myself as a convert to the Orthodox faith, I think that looking at icons, traveling with them, even venerating them in church, takes me further from idolatry, not closer to it. They serve as visible reminders of the invisible world, and they help me bring God to remembrance — they certainly don’t become a substitute or replacement. 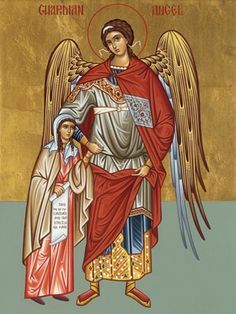 Icons do have a kind of power to them — as do angels — but for those who love God, that power draws us nearer to Him in truth, and eliminates, rather than creates, confusion. Which brings me to this short passage from An Acceptable Time, by Madeleine L’Engle. As I posted before, L’Engle is one of my favorite children’s authors, and this book is the last in the series that begins with A Wrinkle in Time. Like the others in the quintet, An Acceptable Time follows members of the Murry and O’Keefe family, who seem to always get into scrapes that take them off into other ages or other universes. While staying with her grandparents in Connecticut, Polly O’Keefe, a young woman, has been taken back three thousand years in the past, and to make matters worse, she has been taken prisoner by a tribe that considers her some kind of goddess who will either be of use to them as a miracle-worker or a sacrifice(!) The tribe’s leader, Tynak, questions Polly to try to discern what he should do with her, and looking for some item to impress him, she remembers a small icon of a guardian angel that was given to her by her friend, Zachary. She takes it out of her pocket and holds it up for him to see. Tynak stared at the icon intently, almost fearfully, then looked at her questioningly. She pointed to the child in the icon, then to herself. Then she pointed to the angel, and stretched out her arms as though embracing all of Tynak’s compound, the tents, the lake, the great snow-capped mountains on the far side. He pulled his hand away, still holding the icon. “Please give it back,” Polly repeated and reached for it. It was absurd to feel so threatened by Tynak’s taking the icon. It was nothing more than a painting on wood. Zachary had said that it had no value. But it was an affirmation that he cared about her … Her voice shook. “Bad power for you.” She could only repeat herself. And that power asserts itself by the timely appearance of Polly’s dog who makes it clear that he takes takes a dim view of any aggressors. And so the icon is quickly returned. Good power for me. In the excerpt, Tynak mistakes the physical item, the “painting on wood,” as having power in and of itself, and thinks that possessing it — especially taking it away from a prisoner, perhaps — will grant him protection or strength or extraordinary abilities. Living a thousand years before Christ, what else could he think? Polly, on the other hand, knows that it isn’t the object that matters, but what it symbolizes. Although that has something to do with human kindness, it is also the Christian knowledge of the true God, who is as boundless as the lakes and mountains and all that they can see. There’s something to that, I think. We don’t always think about it, but maybe we should, at least a little more often.